"We can drive out poverty in some of the most vulnerable communities," he told BBC News. "We are talking about smallholders with just one, two or three animals. "If the animals die or are not producing to their potential, it means no income for the smallholder's family and the risk of falling into absolute poverty." He told me how each August his father would have a pig ready to sell to pay the year's school fees so he could go to class in September. 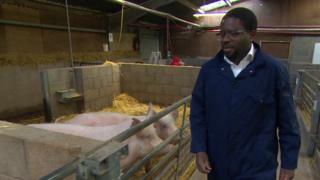 But one year in the mid-80s, there was an epidemic of African swine fever and Prof Djikeng's father had no pigs to sell. But, he told me, the incident had taught him how children's prospects are based on livestock in Africa and how easily they can be robbed of their futures when disease strikes. "Growing up, I understood that if you are farming and you are that vulnerable, there has to be something there to help, perhaps resilient animals, disease-resistant animals, and developing the best practices. "At the time, the science was not good enough to make a difference. And it was my commitment to change that. It was a personal mission." Prof Djikeng's centre was funded by the Gates Foundation. He saw that the key to giving farmers like Prof Djiken's father more security was to harness research to create more resilient livestock. The firm has spliced in what it calls the "slick gene" into an embryo of a Red Angus, a US dairy breed. But the company's chief scientific officer, Dr Tad Sonstegard, told BBC News that the initial signs were that Genselle was settling in well with her new surroundings. "She acts like a normal animal with no signs of heat stress in what is now the middle of summer in Brazil. And that is very unusual," he said. The organisation's research manager, Phil Brooke, told BBC News that it was vital to support smallholder farmers in Africa, who are struggling to maintain an income from their animals. "However, we see gene editing as an invasive technology to be avoided wherever possible in favour of traditional breeding," he said. "Whatever technology is used, it should be applied in ways that are not detrimental to the animals. "It is good to breed animals that are adapted to their environment but, for example, heat-tolerance should not be used to keep too many chickens in a shed. "Likewise, disease-resistance shouldn't be used to keep animals in overcrowded conditions in which disease would otherwise be likely to spread." "In Africa, the scrutiny by the farmer on their animals is much higher than in the western world. If you have five animals, they are really important to you an if three of them die, that is catastrophic. "The project is to improve the genetics of animals through traditional breeding if possible and if we can't we will use gene editing. That has to be good for the animal; in turn that has to be good for the farmer."